At the Search Engine Strategies conference in San Jose, many search engine marketers were surprised to discover that Yahoo News (http://news.yahoo.com) now reaches a larger unique audience in the U.S. than AOL Search. Almost as many were stunned to find out that Yahoo News reaches more than three times as many Americans as Google News (http://news.google.com). First, they double-checked the data. According to Nielsen//NetRatings, Yahoo News reached a unique audience of 20,966,000 Americans at home and at work in June 2004. Google News reached 6,325,000. Compare that to the top search engines for the same month. Google reached a unique audience of 62,065,000 Americans at home and at work in June 2004. Yahoo reached 47,050,000. MSN Search reached 40,937,000. And AOL Search reached 20,253,000. That's right! Yahoo News reaches a larger audience in the U.S. than AOL Search. Who knew? Ask Jeeves reached a unique audience of 10,474,000 Americans at home and at work in June 2004. Overture reached 7,566,000. My Way Search reached 6,513,000. And Information.com reached 5,915,000. Wait! 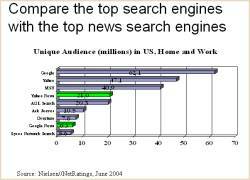 That means Google News is one of the 10 top search engines - if you count news search engines as search engines. About a year ago, Mark Glaser wrote an article entitled "Google News Finally Makes the Grade" (http://www.ojr.org/ojr/glaser/1062114819.php) for the USC Annenberg Online Journalism Review. In it, he took Nielsen to task for failing to include Google News in its Current Events & Global News category. That's where you'll find them today. Yahoo News is right behind CNN, which reached a unique audience of 22,405,000 Americans at home and at work in June 2004, making Yahoo News #2 in the category. 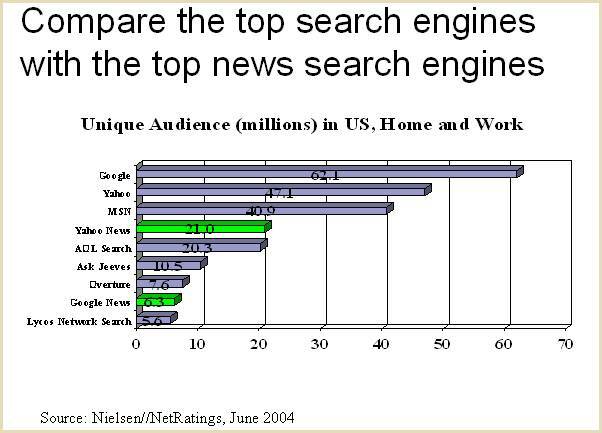 A short way down the list, you find Google News right behind USAToday.com, which reach a unique audience of 7,374,000 Americans at home and at work in June 2004, making Google News #11 in the category. So, news search engines have been hidden in plain sight for almost a year. They have just been stuck in a different category. So, it's not surprising that people were surprised. It's like bumping into a neighbor from around the corner in Acton, MA, in front of our booth Search Engine Strategies in San Jose, CA. Hey, what are you doing here? So, why should search engine marketers care if news search engines have been experiencing the kind of growth spurts that teenagers go through while away at summer camp? News search engines cull information from thousands of "news sources" - including the press release distribution services. Just do a search on Google News for Mike Grehan - just to pick a name out of the hat. You'll not only find articles in ClickZ News, e-consultancy, and Search Engine Watch that mention him, you'll also see press releases distributed by eMediaWire and PR Web that mention him, too. This means you can optimize a press release for the news search engines - just as you can optimize a page on a website. They difference, however, is that the news search engines only contain stories from the past 30 days, while it can often take up to 30 days to get the search engines to index a new page. This isn't a trick question. If you optimize a press release that doesn't contain compelling news, then you might get someone to click on your headline, but you won't get them to click through to your website after reading the first few paragraphs. If you do have compelling news, you can generate web traffic and sales leads as well as publicity. One optimized press release generated more than $80,000 in ticket sales for Southwest Airlines as well as articles in The New York Times, Washington Post, and more than a dozen other media. And this doesn't work just for the big brands. One optimized press release prompted CNN to interview the editor of HSToday Magazine. Using ClickTracks Analyzer Hosted, WineZap was able to see that 32% of the people who read their press release clicked on one of the three links to relevant pages on their new website. How do you take advantage of this new opportunity? Well, that's an article for another newsletter. The good news is that you can do this yourself. If you don't have the time or talent, you can also get help from literally dozens of search engine marketing firms. Or, if your firm would like to offer this kind of help to your clients, you can join this growing band of brothers. For more information, go to http://searchenginepromotion.prweb.com. Tell 'em Greg sent you. Note from Greg: I should disclose that my company is on the list, too. But the opportunity presented by the unnoticed popularity of Yahoo News and Google News is much bigger than any one firm.